Okay, Disneyland, old boy...It's your birthday today, so blow out the candles on your cake and make a wish. Atta park! Now, what did you wish for? Oh, I know it spoils the wish to blow and tell, but tell us anyway. What does a 53 year old cultural institution wish for? A pretty new Skyway, maybe? How about losing a little weight - you could start with "Honey I Shrunk the Audience"! I bet you're wishing you could be 10 years old all over again, just like all of us do; a bright-eyed young thing with your Main Street still in its original and best color scheme, a swanky Tahitian Terrace packing 'em in every night, and big bands with big headliners...or at least a little Dixieland jazz. You know, I really miss your Dixieland jazz. How about merchandise that is specific to each of your themed lands - golly, that would be a total diller, wouldn't it? Man! Say, I'm just thinking, if you were 10 again, Walt would still be around, wouldn't he? I bet you still miss him. We do too - terribly. At least your castle is about to re-open with a beautifully restored "Sleeping Beauty Walk-Thru" attraction - Walt would certainly be thrilled with that, I imagine! Do you think he'd let you drop that awkward "Resort" moniker and let you just be plain ol' Disneyland again? Why not - that's your real name, for goodness sake?? Oh, sorry if I'm getting too personal. How rude. After all, it's YOUR day, and whatever you wish for is your own business. You know, you still look great - a total knockout actually - and I predict a wonderful future for you. I won't say "don't ever change" but just don't stop being yourself, okay? Have a happy, fabulous, amazing birthday, Disneyland - and many, many more. Fifty-three is something to be really proud of...Heck, I'm right behind you myself....a ways! Today I'm sharing three pieces of 1955 artwork created for a full-color newspaper section advertising the opening of Disneyland. 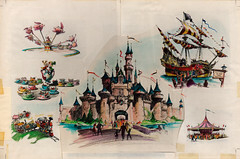 Some of the color illustrations seen here were also printed as the Park's very first souvenir postcards. Pretty cool, huh? "Enter this fascinating realm over the drawbridge of Sleeping Beauty's Castle, whose parapets and towers rise dizzily above you. 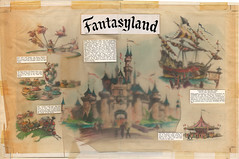 Here in Fantasyland, Walt Disney recreates the fairytale folk he has immortalized in film, book and television --Peter Pan, Snow White and the Seven Dwarfs, Sleeping Beauty, Mr. Toad from Wind in the Willows, Dumbo, the Flying Elephant, and a host of others. Here they are, close enough to touch, in amazing realistic presence. You may ride them, or stroll with them, in the pirate galleon to Never Never Land, to a mad tea party, whirling with Dumbo in aerial gyration, to the diamond mines with the Seven Dwarfs, to King Arthur's courtyard -- to many happy ports of Fantasy." And THANK YOU, TONY BAXTER for restoring the Castle Walk-Thru! We can't wait for December to get here, so we can all see it! 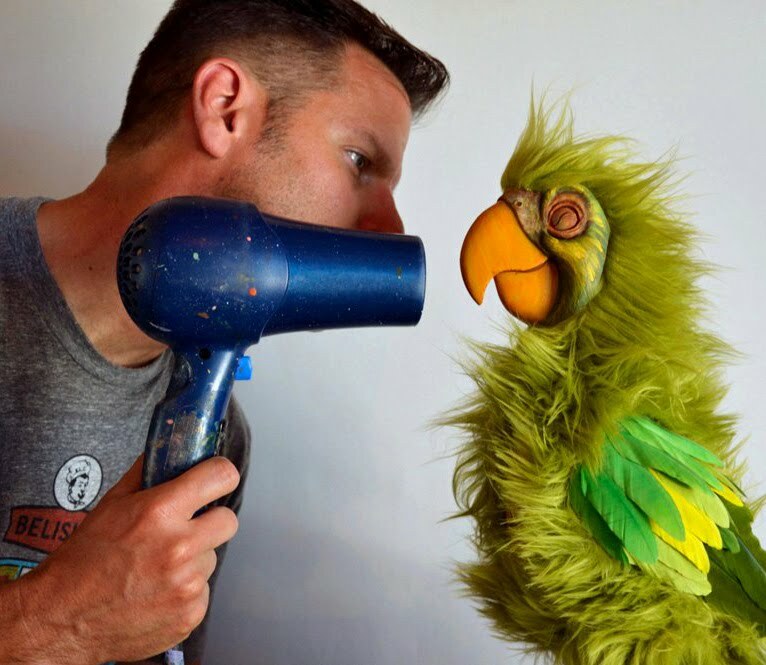 Kevin, There are many things I enjoy about your blog and this post is one at the top of my list. Thanks for all your input on a place that has been in my memory for more than 50 years. Richard. This post could not have been more lovely. Happy Birthday, Disneyland! Super amazing stuff, and nicely written too. I guess today is technically the anniversary of the first day that the general public was allowed to see the park? Those wonderful illustrations are certainly familiar to people who know the "concept cards". 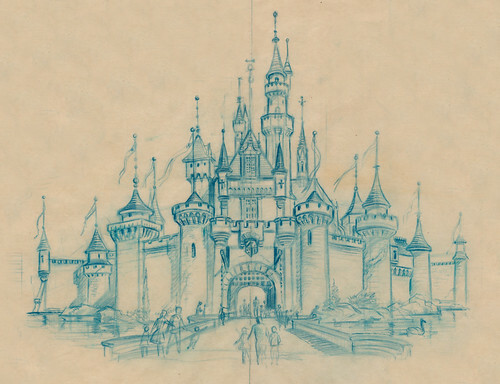 With the wonderful news of the return of the Sleeping Beauty Castle Walk-Through, I hope Disneyland's wish would be for a "great big beautiful tomorrow..." 'cause it looks like that just might be on its way! Oops! Make that Rosemary CLOONEY! Wow! 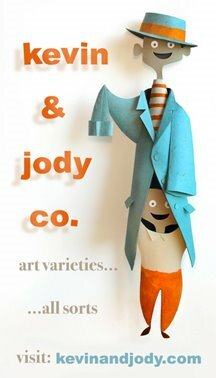 Fantastic post... followed the link from O.C. History Roundup and loved your happy birthday post. Those renderings are fabulous. I always love seeing those. Thanks for the great post; I look forward to coming back for more in the future. A year later, your birthday tribute still waxes as a fitting tribute to the Happiest Place on Earth. 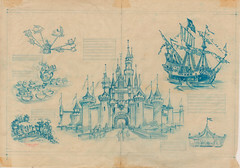 Happy 54th, Disneyland, and thanks, Kevin, for sharing this great piece with us!